After decoding the packet, we can see a breakdown of different fields. Figure 8 shows the initial packet sent by the client to the server. It is relatively empty aside from the “magic” bytes, length of data and type of communication. Depending on the command response sent from the server, a packet may be bigger than 0x52 bytes. Data beyond 0x52 bytes is zlib compressed then encrypted with AES in CBC mode with a null initialization vector (IV) and a key sent from the server that is padded to 32 bytes. We captured live traffic from the server, and observed that the encryption keys sent from the server are ephemeral. This means that each new session with the server is given a different key used to encrypt data sent back and forth within that session. This is a marked improvement compared to the previous version, where only XOR encoding with a one-byte key was used for encryption. After decoding the packet it receives from the server, the backdoor validates certain fields like the “magic” bytes and makes sure the length of the data being received is not over a certain amount. Throughout the program execution, it also checks and handles any errors that may have been generated. The client initiates a session with the server by sending a packet with 0x2170272 in the command field. The server then responds with an ephemeral encryption key and a command. The client checks if the received packet from the server is valid. The client executes the command sent by the server and responds with a zlib compressed and AES encrypted blob of the result then sends this back to the server. 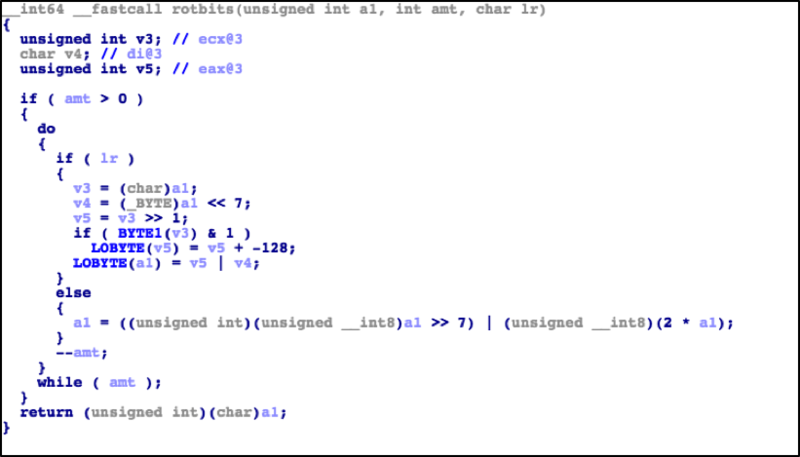 Unlike the previous versions of OceanLotus where the commands can be easily gathered from its strings, the author has obfuscated the functions with constant values. We decoded the following available commands as seen in Figure 9. When the backdoor is launched, a file is created in /Library/Preferences/.files or ~/Library/Preferences/.files depending on the victim’s user ID. This file (see Figure 10) contains a timestamp and the victim’s name concatenated with the machine’s serial number which is then hashed twice with MD5. This is then copied to a buffer that is 0x110 bytes long and AES encrypted in CBC mode with a null IV and a key of “pth”. 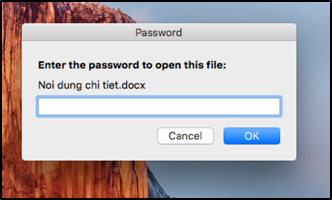 It is then saved into the file. After this file is created, the client sends its first packet to the server with 0x2170272 in the command field. The server acknowledges and responds with the same command and the client verifies that the file has been created. The server then sends this command with an ephemeral key shortly after it sends the 0x2170272 command. The client gathers all the data seen in Figure 11, encrypts it with the key provided by the server and sends it back. One thing to note is the Base64 string that is sent in this packet. This string is static in the binary and does not change, which may be indicative of a marker for campaign or version identification. Not highlighted in Figure 11 but also included in this packet is the kernel boot time which may be used by the C2 server to help determine if the backdoor is being run in a sandbox environment. 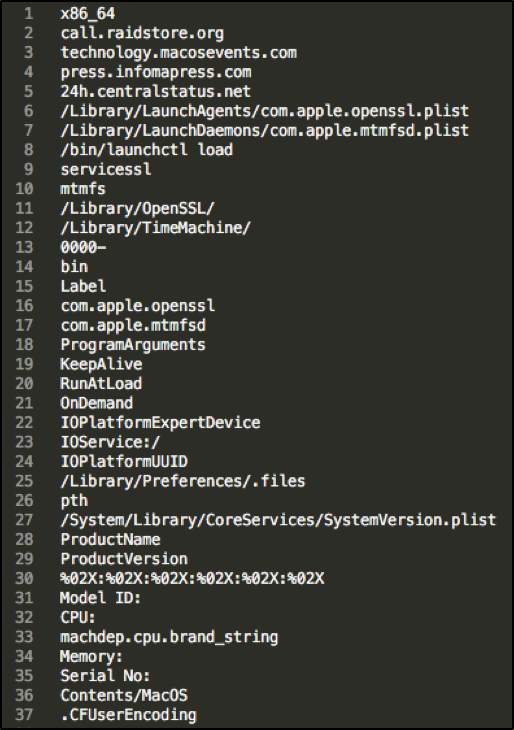 These commands load a dynamic library using dlopen() and obtains a function pointer to execute within that shared library using dlsym(). Unfortunately, we do not know which dynamic libraries or functions are used for each command since these are server supplied and we were not able to capture any communication that used these commands. However, we can postulate that since the parameters to the functions have the same number of arguments with the first being a fairly large constant similar to the command constants, (see Figure 12) and the backdoor has a function for receiving files, it is possible that these functions correspond to a shared library that the server uploads to the victim host. This means that additional functionality can be added to this backdoor by loading modules directly from the C2 server. 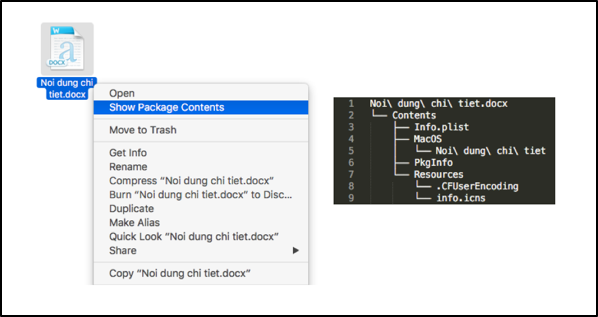 Most macOS malware in the wild today are not very complex, but threat actors have been quickly improving their tradecraft. The increased level of sophistication and complexity may be indicative of increased targeting of macOS hosts looking to the future. 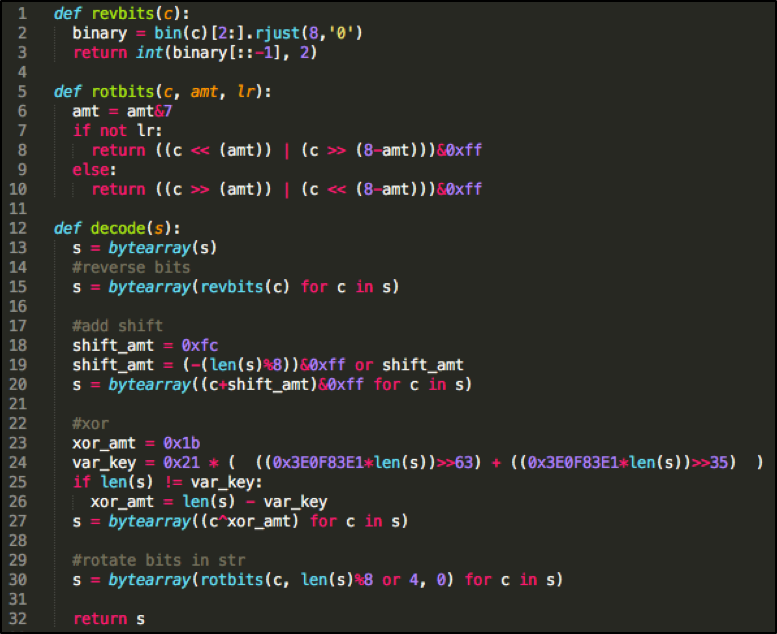 With this OceanLotus attack in combination with recent macOS versions of the Sofacy group’stoolset, we have now observed multiple espionage motivated threat actors targeting macOS. It is imperative that the same types of strong security practices and policies organizations use to defend Windows devices are applied universally to include macOS devices as well. Apple has already updated the macOS protection systems to address this variant of OceanLotus.